The Man From The MHRA. Endangering Public Health With Precipitate Action On CBD. The Medicines and Healthcare Products Regulatory Agency (MHRA) apparent decision to designate cannabidiol (CBD) as a medicine is an unholy mess and has been handled about as badly as it is possible for a government agency to deal with a matter of public safety. The desk of Dr Ian Hudson, the Chief Executive, will shortly be groaning under the weight of correspondence from MPs asking him to explain exactly what is going on. We know that the MHRA call centre has been swamped with calls from people desperate for information and in fear that they will be cut off from supplies of the food supplement that is so important for their health. Many are now being told that no final decision has been taken and everyone is in limbo waiting for some coherent response. We say “apparent decision” because nothing is clear, no public statement has been issued and anything you have seen in the press is from responses to individuals. Crispin Blunt, the Conservative MP and a member of the CLEAR advisory board has written to Dr Hudson urging him to meet with CLEAR, Professor Mike Barnes and the newly-formed UK Cannabis Trade Association to discuss what interim arrangements can be put in place. Tens of thousands of people’s health has been placed in jeopardy and not for trivial matters. People suffering from serious conditions such as epilepsy, chronic pain, anxiety and Crohn’s Disease have come to rely on CBD products to maintain their health. There are also hundreds of jobs in danger at suppliers providing CBD to the UK market. We know that many CLEAR members have asked their MP to write to the MHRA seeking clarification. In Crispin Blunt’s letter he goes further. CLEAR has received a holding response from the MHRA indicating that a meeting will be arranged and that we will hear by the end of this week. Responsible action from a government agency that is supposed to protect, not endanger public health is urgently needed. In a letter dated 15th August 2016, Amber Rudd, the new Home Secretary, has invited CLEAR to raise “any queries and concerns” about present UK policy on cannabis. This is the first time since 2006, with Charles Clarke, that the UK cannabis campaign has had any direct contact with a serving Home Secretary. It reflects the reality, now recognised in government, that changes in cannabis policy are imminent. In recent months, there has been a manifest and significant change in attitudes within the Home Office. We have seen this through the process of obtaining a low THC cultivation licence for our partnership with GroGlo Research and Development. The response from the drugs licensing department has been enthusiastic. There has been no difficulty with our declared purpose of producing CBD oil for sale as a food supplement and we are now in detailed discussions on our application for a high THC licence, looking towards clinical trials for a medical product for chronic pain. As soon as Theresa May announced that Amber Rudd would be heading up the Home Office, I contacted my MP, now Sir Oliver Letwin, thanks to Cameron’s resignation honours list. Although he will not openly support our campaign, in the past year or so he has been very helpful indeed, meeting with me on roughly a monthly basis and helping me navigate through the Conservative government. He has now put me in direct contact with Ms Rudd and I will be preparing a written submission as a preliminary to a face-to-face meeting. In accordance with CLEAR policy, our first concern is how we can enable UK residents to gain access to medicinal cannabis on a doctor’s prescription. In practice that means Bedrocan products as there is presently no other source of prescribable, consistent, high-quality, herbal cannabis. I would expect that to change very soon though. Both Canada and Israel look like potential near-future sources. GW Pharmaceuticals is undoubtedly considering entering the market and our venture with GroGlo could shift gear depending on how quickly UK policy changes. We will also be addressing the need for wider reform and a legally regulated market for adult consumers. Although medicinal access remains the top priority, there is no doubt that more overall harm is caused by prohibition of the recreational market. It is this that creates the £6 billon per annum criminal market which is the cause of all the social harms around cannabis. This will need to be handled much more carefully as, due to nearly a century of misinformation and media scaremongering, many people still retain great fear as to what legal cannabis will mean. The fact is that we need to work with Theresa May’s government and the anti-Tory tribalism that many still adopt is nothing but an obstacle to reform. 1. A final separation from the ridiculous ‘free the weed’ movement and ‘stoner’ groups which are incapable of understanding how they are seen and despised by wider society. 2. Differentiation between medicinal use and the more controversial legalisation for adult, recreational use. 3. Shift public attention onto scientific and medical evidence rather than the very poor standard of media reporting. 4. End the fake policy that says ‘cannabis is dangerous therefore it must be regulated’. Educate that nearly all the harms around cannabis are caused by its prohibition, not by cannabis itself. 5. Emphasise the importance of harm reduction information, education about excessive use and essential investment in treatment for those who do suffer health harms. 6. Clarify that decriminalisation is no solution and is a dangerous option that would probably increase harm. The product needs to be sold within a properly regulated environment, careful that over-regulation would support a continuing criminal market. Today CLEAR publishes ‘Medicinal Cannabis:The Evidence’, a comprehensive and up to date review of the evidence supporting the use of cannabis as medicine. The report details an extraordinary quantity of peer-reviewed, published evidence that demonstrates the efficacy and safety of using cannabis to treat a wide range of conditions. It looks in detail at five therapeutic areas where the evidence is strongest: Alzheimer’s Disease, Cancer, Chronic Pain, Crohn’s Disease and Multiple Sclerosis. Archaeological and written evidence suggests mankind has used cannabis for medicinal purposes for as long as 10,000 years. In the 19th century nearly half of all medicines in the British and US pharmacopeia contained cannabis. With the rise of new pharmaceutical medicines it fell into disuse but in 1996 California introduced the first ‘medical marijuana’ laws. Now 210 million people in 34 US states and 250 million people in nine European countries have some form of legal access. CLEAR Cannabis Law Reform is the UK’s leading drugs policy reform group with more than 330,000 followers. It aims to end the prohibition of cannabis most urgently for those who need it as medicine. CLEAR also advocates replacing the anarchic mess of prohibition with a framework of regulation which would allow proper control of the product’s strength and quality while providing protection for children and the vulnerable. 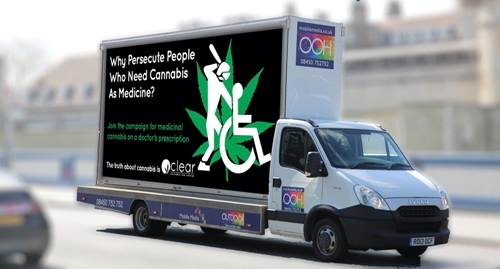 Medicinal Cannabis AdVan Campaign in London. 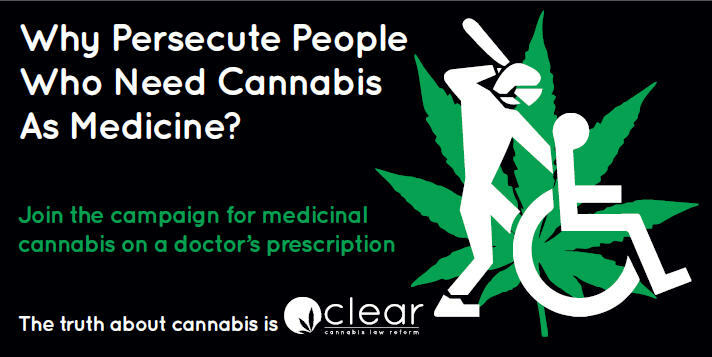 Join The Campaign For Medicinal Cannabis On A Doctor’s Prescription. Despite overwhelming evidence, the UK government insists that cannabis has “no medicinal value”. Present policy is deeply cruel and means that at least one million people in Britain are forced to become criminals in order to deal with their pain, suffering or disability. We must change this dreadful and unjust policy. It’s time to help rather than persecute people who genuinely need cannabis to improve their health. DONATE HERE. CLEAR is the UK’s leading drugs policy reform group with more than 270,000 followers. We will run an AdVan for one week in central London during the busy pre-Christmas period. This will deliver the simple, direct message that you see above and it will be backed by a supporting PR campaign, lobbying of government ministers and MPs as well as further information on the CLEAR website. Please donate whatever you can. Every pound makes a difference. We need to raise £3500 to run the AdVan for one week. If we raise more we will run it for longer. DONATE HERE. Our Simple And Reasonable Request To UK Government. In 1998, GW Pharmaceuticals was granted a licence to grow cannabis and its cannabis oil medicine, Sativex, is now approved but doctors are prevented from prescribing it because it is so fantastically expensive. The Dutch government approves a cannabis medicine called Bedrocan which provides exactly the same as Sativex at a tiny fraction of the price. Sativex costs between £375 – £560 per month. Bedrocan costs £35 – £95 per month. All we ask is that if a doctor prescribes Bedrocan, the Home Office should issue an import licence. This is a narrow, tightly defined reform that will not encourage illicit use but will provide enormous help to some very poorly people. DONATE HERE. Every year, thousands of medicinal cannabis users are prosecuted for possessing or growing cannabis. Often it is the only medicine that helps them with chronic pain, fibromyalgia, MS, Crohn’s disease, epilepsy, depression or many of the conditions related to aging. It is also used to mitigate the side effects of chemotherapy and HIV/Aids treatments. In November 2014, the Liberal Democrat MP Norman Baker resigned as a government minister because of the Conservatives’ refusal even to consider drugs policy reform. In July 2014 he met with members of CLEAR and publicly called for cannabis to be legalised for medicinal use. Other ministers are more concerned with stopping people getting high (which they are going to do anyway) than in helping those with severe medical conditions. DONATE HERE. Present policy abandons control to organised crime and street dealers. If cannabis were properly controlled, it would be taken out of the hands of criminals. Growing, importing, distributing and retailing would become legitimate businesses, subject to proper control and regulation. We Need CLEAR Common Sense About Cannabis. Medicinal use: Alzheimer’s, arthritis, cancer, chronic. pain, dementia, diabetes, epilepsy, glaucoma, MS,. Parkinson’s, stroke therapy. CLEAR’s policies are based on independent, expert research carried out by the Independent Drug Monitoring Unit in 2011. – A summary of the health harms of drugs. NHS, 2011. – Emerging Clinical Applications For Cannabis & Cannabinoids. A Review of the Recent Scientific Literature 2000 – 2011, NORML, 2011. – Bringing cannabis back into the medicine cabinet, Prof. Les Iversen, 2010.